The school I work for is going 1:1 with Chromebooks next year and we are in the process of choosing which one to go with. We know we wanted a sub $300 Chromebook with 4gigs of ram and a 11" screen. 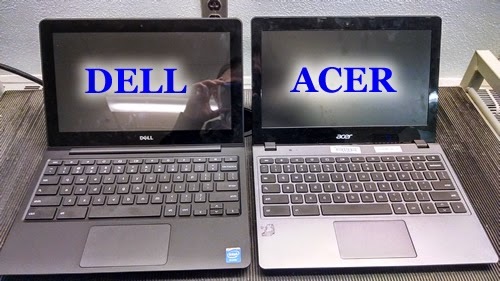 We bought both the Dell Chromebook 11 and the Acer 720. On the outside these two devices seemed almost identical. Rather than tossing both off a desk we decided to see how easy it was to change the screen on both since that is likely to be the most common repair our department would need to do. The pictures are not the best, as they were quickly taken, but they should give you a general idea. I ran a 1:1 at a previous school and also learned about a few other common wear items that I needed to look for. So when we disassembled these two devices we looks specifically at the following items: Hinges, screen mount, power adapter plug, secureness of internal devices and keyboard key replacement. These devices will be opened and closed more times than most other laptops and the hinges tend to need tightening after year 2. If they are loose then you run the risk of the screw mounts pulling out, which is a harder fix than if the screen itself broke. Worse yet is that having to tighten 450 screens is not something our school IT department has time for. The mount to the dell appeared to be secured to a metal plate where the acer appeared to be mounted to plastic. 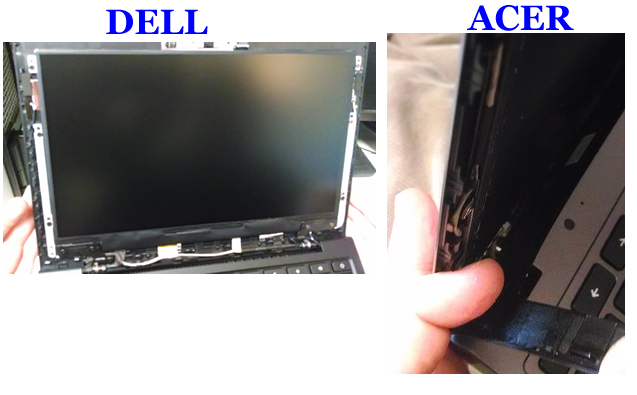 The screen mount on the dell was much better, as it had the screws much farther apart. I am bias here as I had some earlier ACER's that the plastic mounts had come loose on and had to hold them together with superglue. It was a different model but the hardware looked identical. I know many people twist the screen to see how stiff it really is, well I was more concerned how beefy the metal mount holding the screen in place was. The dell was the clear winner here. The Acer barley had anything holding the screen in place, while the dell had a pretty solid piece of metal. The Dell's screen held another great feature that in-of-itself I think makes it should be the #1 choice for a 1:1. 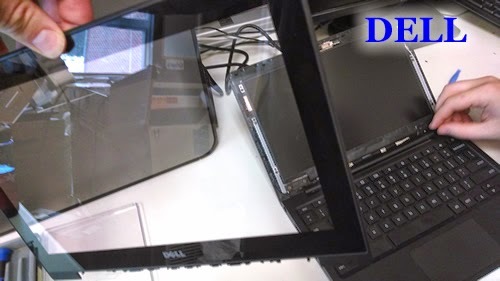 Unlike the Acer and many other laptops the Dell has a complete plastic cover over the LCD screen. Again these devices will be plugged in and unplugged, moved and who knows what else, which can really damage the power adapter plug. In some cases if this plug pulls off then it means re-soldering the connectors back on. Before I took these devices apart I was very worried for the Dell as the plug had a lot of play in it. However once I took it apart I found that this was because the Dell's power adapter plug is detached from the motherboard. This can wiggle, and get hit all day long and it will be fine. If it does break then a very simple (and cheap) plug is all that is needed. 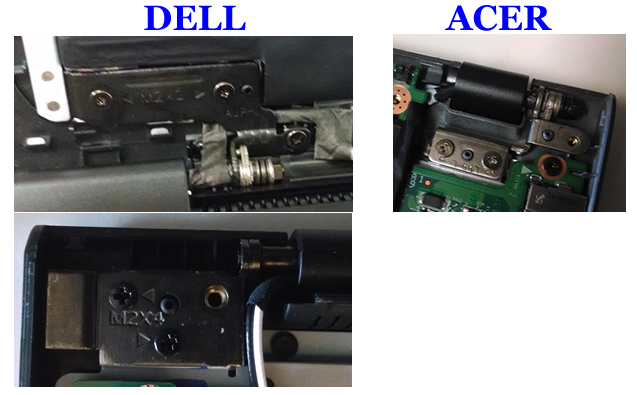 I had one generation of Acer netbooks where the hard drive was just held in place by pressure and 1 screw holding a bottom plat holding that in place. Needless to say I had wound up super-gluing all the hard-drives in place one summer. Acer seems to have fixed this for the 720 and between the Dell and Acer this was almost a tie, except Dell's batter had 4 screws mounting the battery in place where the Acer had two plastic tabs and two screws. Both backs of the devices are a single plat held on by screws. This is a big improvement for Acer. Both keyboards were very similar. We were not able to figure out how to change the keyboard on either Chromebook during our disassembly. I guess this one we will find out the hard way.